Le Premier Parfum is the debut fragrance from photography studio Coolife, founded by Pauline Rochas (granddaughter of Marcel and Hélène Rochas) and Carole Beaupré. Neither conventionally feminine nor masculine, Le Premier Parfum is a woodsy floral scent that’s distinctive, compelling and seductive. The warm and carnal fragrance is intended to elicit desire in the wearer, and in those he or she encounters, by activating the sacral chakra – the energy located beneath the navel that unlocks sensuality and eros. 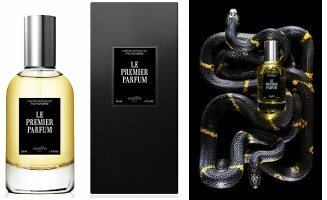 Le Premier Parfum is not merely a fragrance, but an aphrodisiac: heady notes of ylang-ylang, various species of sandalwood, and other secret ingredients embody an androgynous and polymorphous sensuality, registering desire in the olfactory dimension. Scent – the most unmediated and deeply intimate of human faculties – unites lovers in an irrational and convulsive attraction. Le Premier Parfum was developed by perfumer Patricia Choux, who was asked to use only seven ingredients to symbolize the seven chakras in the human body. Additional notes include patchouli and labdanum. Coolife Le Premier Parfum is a hand numbered limited edition; it is available now at Twisted Lily, $175 for 50 ml Eau de Parfum. Oy, such mishagosh over a woodsy floral. Ha, true, but I still want to try it. Ya, really…I don’t care about chakras nor do I believe in them, such silliness in the ad to me..should be an entry in the contest really. Not interested in trying this, I can’t take it seriously, just me though. Gosh, I don’t care either but still want to try it!